First a food truck stop, now a dinner crawl. Burlington is once again taking a cue from larger cities with the introduction of Dishcrawl Burlington . Aziza Jadallah, Burlington’s Dishcrawl “ambassador,” says she learned about the national company through Facebook and Twitter. Dishcrawl organizes walking tours with stops for tastings at selected restaurants kept secret until just before the event. In the two years since its inception, the brand has grown from its original home in San Francisco to include crawls in 46 states and five Canadian provinces. The first Dishcrawl Burlington will begin on Tuesday, June 25, at 7 p.m. For two and a half hours, diners who’ve paid $45 per head will work their way around Church Street and its environs, trying special dishes from chefs and meeting restaurateurs. Four restaurants will take part. Jadallah will wait till two days before the event to reveal to participants where they’ll be eating, but says she’ll begin dropping hints on Twitter and Facebook in the next week. Well, that didn’t take long. Three weeks after Magic Hat Brewing Company filed a trademark injunction against a Kentucky microbrewer, West Sixth Brewing, the matter is a wrap. In a short statement, both companies announced they had “mutually resolved” their disagreement. 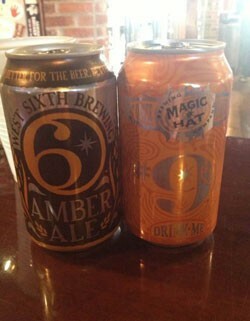 Magic Hat had alleged that the number “6” logo that adorns West Sixth’s signature beer was too similar to the label of #9, Magic Hat’s flagship brew. Now West Sixth seems to be taking it all back. “Magic Hat really made them eat crow,” Kunin writes in an email. The gastropub wave arrived in Rutland last month with the opening of Griffin’s Publick House at 42 Center Street. This past spring, co-owner Darwin Harder told Seven Days that he hoped to supply Rutland with the upscale-casual spot it lacked. True to form, chef Paul Kropp’s menu aims both high and low. Duck-fat fries, poutine topped with short-rib ragout, three burgers (beef, turkey and veggie), and wings anchor the fare. But the menu also features a charcuterie board, house-cured duck confit and wood-fired flatbreads, one of them topped with Korean-style barbecued short ribs. Sixteen taps serve up beers from Switchback Brewing Company, Allagash Brewing Company and Lagunitas Brewing Company, among others, plus a low-alcohol “Griffin’s Private Label” beer brewed by Long Trail Brewing Company. Griffin’s Publick House is open seven days a week for lunch and dinner, plus late-night hours on Friday and Saturday.